1. 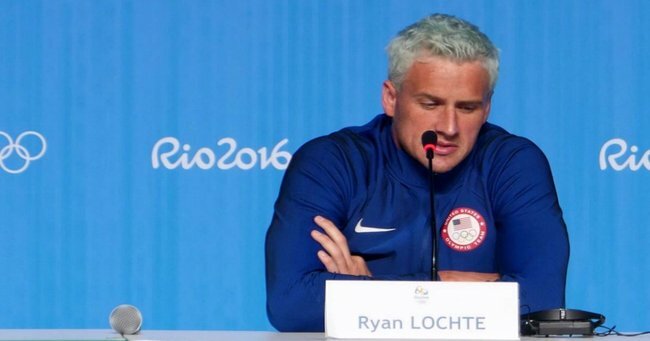 US Swimmer Ryan Lochte lied about being robbed at gunpoint. Police in Rio say they have evidence gold medallist Ryan Lochte was not robbed at gunpoint but instead was with a group of swimmers involved in a fight at a petrol station after one of them kicked a toilet door in, and police say they invented the robbery to cover it up. A Brazilian police official who had reviewed the video images said that there had been no armed assault, contrary to what the swimmers had claimed occurred after they left a party in the early hours of Sunday on the way back to the athletes’ village. Officials say that at 6am the swimmers all went to the bathroom at the petrol station, in the process damage was done to the bathroom door and a security guard was involved in a “brawl” when he tried to stop the swimmers leaving in their taxi. Witnesses, including a person who offered to translate for the swimmers, said that they paid money to the manager before leaving. Lochte returned to the US on Monday, but authorities stopped two other swimmers, Gunnar Bentz and Jack Conger from leaving the country at the airport on Wednesday. Rio games organisers defended their actions, saying they were just kids who were having fun and made a mistake. “These kids tried to have fun, they tried to represent their country to the best of their abilities,” Rio 2016 spokesman Mario Andrada told reporters. 2. Aussie athletes banned from closing ceremony for breaking curfew. Olympic gold medallist Emma McKeon and Australian team mate Joshua Palmer have been banned from the Olympic closing ceremony after breaking team curfew. The pair were among a group of Australians who went out in Tuesday night. Palmer claims he was robbed of $1000 after he was forced to an ATM to withdraw cash while McKeon did not return to the village and instead stayed with friends in Copacabana without informing team management. Chef de mission Kitty Chiller disciplined the swimmers today while every athlete has now been handed a 2am curfew for the remainder of the Games. “I have raised the need for the Swimming Team Leader to ensure he is aware of his athlete’s whereabouts when leaving the Olympic Village and that the swimming athletes observe the 2am curfew. 3. Rio Olympics: Medals in kayaking and sailing overnight. Australia has secured two silver medals overnight in the sailing. Nathan Outteridge and Iain Jensen won the silver in the 49ers while Mathew Belcher and Will Ryan won silver in the 470. Australians Ken Wallace and Lachlan Tame have also won a bronze in the men’s kayak double (K2) 1000m in Rio. Kyrgyzstan weightlifter Izzat Artykov has become the first athlete to be stripped of his Rio 2016 medal after a positive drugs test. Artykov, who claimed bronze in the men’s 69 kg competition, tested positive for strychnine, the Court of Arbitration for Sport announced. While Usain Bolt runs in the 200m final at 11.30am AEST Friday. A court has heard that a man who murdered his wife by stabbing her 56 times had threatened to kill her the day before. Mokhtar Hosseiniamraei, 34, stabbed his wife, Leila Alavi, 26, 56 times in the carpark below the western Sydney hairdressing salon where she worked, with a pair of scissors he had stolen from a nearby supermarket. When police asked him through an interpreter why he had killed Ms Alavi, Hosseiniamraei replied: “Because we were married, and … she broke the contract. I could not tolerate it. And I could not forget it. Prosecutor Craig Everson told a sentencing hearing Hosseiniamraei told police, “When we marry we have a commitment, moral commitment towards one another – in this country, this means nothing”. Hosseiniamraei will be sentenced next week. For domestic violence support 24/7, call 1800 RESPECT (1800 737 732). 5. Domestic violence guide recognises emotional abuse. "It is great to see this benchmark is so comprehensive" Image via iStock. A new “bench guide’’ for courts released by Attorney-General George Brandis yesterday finally details what can be considered family violence. The online guide urges judges to look beyond physical violence when deciding whether to grant a domestic violence order. These signs may include a perpetrator who criticises a partner’s appearance continuously, threatens to have an affair, or criticising housework. “Angry verbal outbursts, staring, silence, ignoring and withdrawal of affection’’. Domestic abuse survivor Kay Schubach told News Limited the guide was a welcome step. 6. Police in Bali hunt for Australian woman over death of policeman. Bali police are searching for an Australian woman and a man believed to be her partner after her handbag was found at the scene of a murder on Wednesday morning. Sara Connor, from Byron Bay, NSW, and a man, Tomas Schon are wanted in connection with the alleged murder of police officer Wayan Sudarsa reports Fairfax Media. The bloodied body of Kuta traffic police man, Wayan Sudarsa, 53, was found on the beach in front of the Pullman Hotel in Kuta by hotel security about 3am on Wednesday. Beer bottles, which police believe were used to kill him, were found nearby. Photographs of the couple are being displayed publicly around Kuta. 7. To the dismay of teachers and child care experts Tasmania has changed the school starting age. A controversial plan in Tasmania has gone through – from 2020 children in Tasmania will be able to start school at four-and-a-half. Education Minister Jeremy Rockliff on Thursday said the bill will be tabled in September, but the reduction in age from five will be optional and not compulsory as initially proposed. “Children will be required to start school in the prep year at five-years-old, just as they currently are. But if parents feel their child is ready, they can start six months earlier, at four-and-a-half,” the minister says. “In turn, parents will also have the choice of sending their child to kindergarten at the age of three years and six months, instead of four years, though this will remain optional." Many teachers and early child care groups opposed the plan. The Australian Education Union&apos;s Helen Richardson told the ABC the plan would worsen existing problems within the education system. "By adding more young kids this is just going to exacerbate the problem."